Another month has ticked over, so it's time for another cost sheet. Phew, this one isn't looking as good as the last two months. Total spending cost was almost $2400! 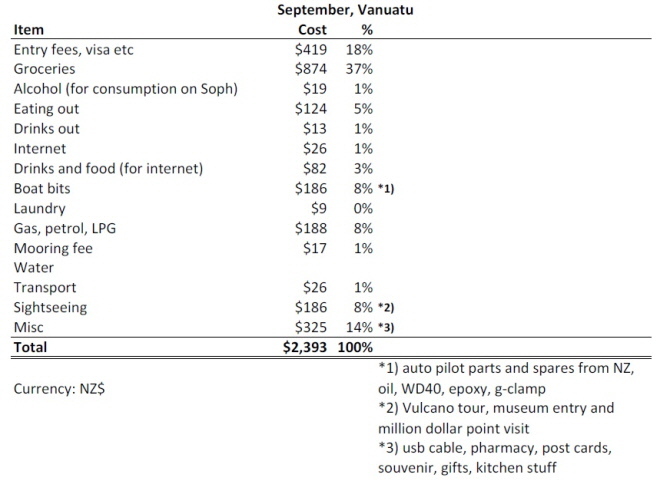 There are several reasons why we spent more than in Tonga. Entry, immigration and exit (already paid) fees are much higher than in Tonga. We had to get a visa extension because we're here longer than one month, and it's only one set fee for up to 4 months, $85 per person. Although food is cheaper than Tonga, there's a much better selection here and we have used up some of our NZ stores, and we're also stocking up for Solomons and PNG, so all in all that means we have bought quite a lot of food here. We have only eaten out for dinner once, but ice creams, cheap lunches etc all adds up as well. We have added two new categories, transport and sightseeing and have spent some money on that like seeing the Yasur vulcano. There is some over-lap between the two, because some sightseeing includes transport cost.